Coverage begins tomorrow with Russia vs. New Zealand on FS1. Kickoff is set for 10:00 AM CT. The tournament will air on the networks of FOX with most of the group stage matches airing on FS1 (Cameroon-Chile match on Sunday will air on FS2 with two of final group stage matches set to air on FOX next weekend). Crazy finish with each side scoring goals late. Video replay played a key role in this match. die mannschaft run out as 3:2 winners over the socceroos despite fielding a very young and inexperienced team. smart move by joachim low to test out younger players against experienced international teams. they've got a lot of talent there. Portugal and Mexico advance to the semifinals. Germany and Chile advance to the semifinals. How 'bout them Fire? Double Wooden Spoon to MLS Cup? I like that it is 23 guys with something to prove. 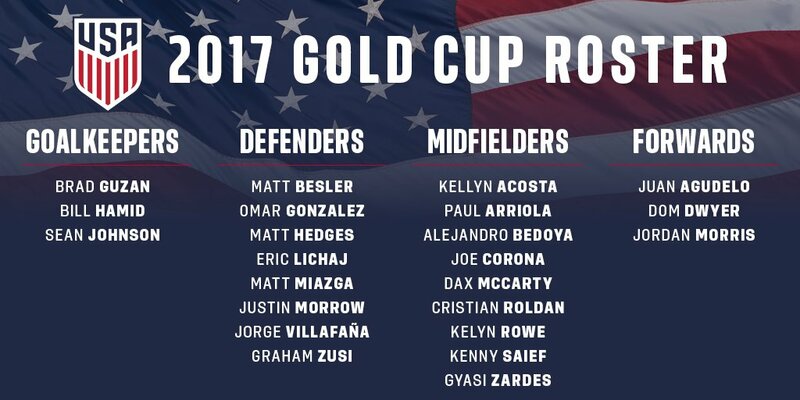 Not one guy on this roster would be in the starting XI if the World Cup was this summer. I just wish there were more youth players from Europe on it. IMO there isn't much need for old MLS guys in the Gold Cup. You already know what they are capable of. Give more youth a chance and they might surprise or at the minimum they will earn valuable experience. -Kenny Saief. He choose the USA over Israel and this is the first time he will be back in the US since he was 3 years old. He plays for Gent who was in the UCL and Europa last year (they beat Spurs 3-2 on aggregate) and he is one of their best players. I've never watched him play before so I am very excited. He can play left back and left wing similar to Fabian Johnson. My hope is he plays well in the Gold Cup and him and Fabian control the left in Russia next summer. -Acosta and Roldan in midfield. These 2 are expected to be paired up in central midfield. Both are only 21 years old and hopefully this a good step towards getting rid of the aging Bradley and Jones midfield. i think it's smart. it's a great way to start transitioning more of the next generation into the first team by testing them against more experienced international teams. Tournament begins tomorrow night with Group A matches of French Guiana-Canada and Honduras-Costa Rica taking place at Red Bull Arena in Harrison, NJ. McCarty and Acosta played center mid very well. Additionally, Acosta is dangerous with free kicks. Dwyer was menacing all match. Should be a good test today. The U.S. match was nothing spectacular. Just kind of there. Dwyer scored the lone goal in the 2nd half for the U.S.